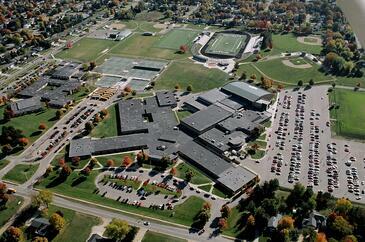 With the Right Information, Your Roof Can Save You Money This is How Jenison Public Schools Did It! Jenison Public Schools were facing some difficult issues with the high school roof. At 20 years old it was aging and leaking in various places. In addition to that, like many other schools they also had many other maintenance issues. Issues that could only be resolved with passing a complex bond issue. They knew it would take 3-5 years to complete the bond issue process and were uncertain if the outcome would be positive. After being called in, our first step was to assemble all the information required for Jenison Public Schools to make the decisions that were best for them, based on the roof conditions and the options that were available. GLS started with a thorough roof inspection, documented with pictures, video and descriptions of the conditions on the roof. These were immediately available via internet on an online portal. In addition, core tests and infrared pictures were taken to verify roof deck and insulation conditions. The results of the inspections, core tests and infrared were pretty positive. It was determined that only a few small areas of the 210,000 square foot roof had wet or damaged insulation. The roofing itself, adhered EPDM, was still in pretty good condition after 20 years. It had some seam failure, deterioration of roof flashing and areas of 'tenting' fasteners put stress on the membrane. GLS determined that if the existing roof insulation could be preserved, it would save over $900,000 in replacement cost. That included disposing of the insulation in a landfill and purchasing a new tapered insulation system. In addition the labor cost for that operation would be $250,000. That would increase the time it would take to reroof once the bond issue was passed. The challenge with that is that the roofing 'season' is short for schools. Typically the time frame to complete the work is from mid-June to late August, while school is out for the summer. Based on the information GLS provided, Jenison Public schools decided to remediate the worst roof issues where water was penetrating the roof system. This was done the first year in a 4 year process. After the first year the other less immediate repairs were made. The total cost for the 4 years of remedial repairs was $50,000. Their decision enabled them to preserve the existing roof until the bond issue was passed. This enabled them to save over $1 million in replacement costs and get the roofing done quicker and with less class disruption. GLS was authorized to proceed on the reroofing for the high school in mid-July and were done with the classroom areas my the time school started. The activity areas, including the gym, auditorium, cafeteria were all completed by mid-October. At GLS our passion is to simplify the roofing process and provide our clients with all the information they need to meet their needs. We don't presume to know what our clients needs are, we ask! We have been doing just that for 50 years and in the process have installed over 10,000 roofs and serviced thousands more. How can we help you?